How do you choose the right mini-split AC system? What brands and models give the best performance? Over the past decade, many homeowners and others in Texas, from San Antonio and the Houston metro area to Dallas and Forth Worth and nearby suburbs have been choosing ductless air conditioning systems and heat pumps to enhance their comfort. Economical and quiet, they offer outstanding efficiency and performance in homes without air duct systems. Residential HVAC contractors throughout the state are seeing more and more requests for this technology every year. HVAC manufacturers have responded by increasing the number of products they offer and making improvements in their efficiency and features each year. Today, Texas property owners can choose from a wide range of brands and models when they’re considering how to best cool and heat their homes. The brands listed below have become popular in the southwest by delivering cost-effective performance, money-saving efficiency and excellent home comfort at prices that can fit any household budget. All offer reliable, quiet AC-only and heat pump versions, along with a wide range of capacities. You’ll find very affordable single-zone units designed to replace inefficient window air conditioners and multi-zone systems that can handle the needs of large, expansive homes. Some local HVAC companies offer just a single brand, while others offer a full range of brands to their customers. 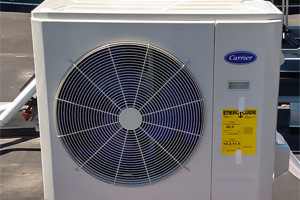 Carrier Authorized Dealers throughout Texas, along with many HVAC contractors, sell and install ductless mini-split equipment manufactured by Carrier itself, along with Toshiba Carrier units. There’s a complete range of single-zone and multi-zone systems available, including models that are ideal for any home and even for light commercial installations. After consulting with you, your air conditioning company will suggest suitable systems and provide you with a competitive price quote. With Daikin’s purchase of Goodman, a Texas HVAC manufacturer, homeowners and commercial customers can now choose from a complete range of ductless cooling and heating equipment manufactured by a global leader in this technology. With models available to handle from 1 to 8 separate zones, you can choose a Daikin Goodman system that offers excellent efficiency and performance, with manufacturer’s warranties up to 12 years. Ask your local HVAC contractor about models that match your needs. Although the mini-split technology is relatively new in the US, it has been popular in Europe and Asia for many years. Fujitsu has long been one of the best-known global manufacturers of ductless AC and heat pump systems. Today, their complete range of products includes single-zone systems along with multi-zone equipment that can handle up to 8 rooms. You can choose from a wide range of indoor units, too, along with state-of-the-art control systems with Wi-Fi capabilities. When it comes to home comfort systems, Haier is a manufacturer with a solid reputation for innovation and quality. Offering a full line of ductless models for single-zone or multi-zone applications, Haier can handle any need. Both residential and commercial systems can be customized to provide outstanding comfort at cost-effective pricing. Choose from the widest range of indoor units with Haier. Ask your local air conditioning company about a model that’s an ideal match. As a global manufacturer of a long list of technological products, LG has become a trusted household name in the United States. Its extensive line-up of ductless air conditioning and heat pump systems has become one of the most popular choices in Texas and other states. Innovative, attractive indoor units, powered by some of the quietest, most efficient outdoor units in the industry are some of the reasons. Single and multi-zone systems are available in all capacity ranges. As one of the most respected global manufacturers, Mitsubishi has a strong reputation for top-quality, dependable products in many categories. Its mini-split AC and heat pump systems are no exception. From affordable single-zone systems to multi-room installations, your local HVAC company can help you select an ideal combination for your Texas home. You’ll enjoy maximum comfort in any weather, along with great savings on your energy bills. With the increasing popularity of ductless technology, tens of thousands of mini-split air conditioners and heat pumps are bringing comfort to homes across Texas, from McKinney, Hutchins and Royce City to Keller, Burleson and Arlington in the Dallas Fort Worth area, from New Braunfels, Pleasanton and Sisterdale to McCoy, Valdina Farms and Castroville in San Antonio area, and from League City, Hockley and Hillcrest to Grangerland, Atascocita and Magnolia in the Houston area. You can find plenty of trusted, experienced local companies that specialize in supplying, installing and servicing the ductless home comfort system of your choice. Ask them about available brands and for a free consultation in your home. They’ll help you understand the technology and assist you in selecting exactly the right system for your needs and budget.